The smallest, lightest, professional ball machine on the market! The Tennis Tutor ProLite is a fully-featured professional ball machine, yet it stands only 30.5 centimetres tall and weighs less than 14 kgs. 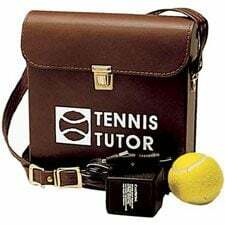 Patented technology borrowed from the world's #1 portable ball machine, the Tennis Tutor, makes it possible. Tennis Tutor ProLite is available in both AC and battery-powered models. Versatile Speed Range: Ball speed is electronically variable from a gentle toss that's ideal for kids just beginning tennis, to hard-hitting ground strokes that will challenge even top amateur players. The wide speed range makes Tennis Tutor ProLite a superb choice for families with players at different ability levels. Versatile Ball Feed: Ball feed rate is electronically variable from one ball every 1.5 seconds (for quick-reaction volleys), to one ball every 10 seconds. Full Range of Trajectories: Ball trajectory is manually adjustable from ground stroke to towering lob. Full-Court Oscillator: When you're ready to hit on the run, just flip the oscillator switch and Tennis Tutor ProLite will deliver shots randomly across the court. Five-second Set-up: The ball hopper opens in seconds to hold 125 tennis balls. Just load the balls and you're ready for action. If you play on public courts or at your local tennis club you'll appreciate the convenience of the battery-powered models (especially since 80% of public courts don't have accessible electric power). The built-in rechargeable battery typically delivers two to three hours of playing time. And it can be recharged between 500 to 1,000 times before replacement. The Battery Models come complete with a plug-in charging unit that fully charges the battery overnight. And there is even a built-in battery charge light indicator. The smart charger lets you leave your Tennis Tutor charging all the time without the possibility of overcharging. The External Battery Pack plugs into the battery charge jack to provide up to four additional hours of playing time. It includes a rugged carrying case with strap, and its own battery charger. These can be ordered on request and usually take approximately 1 month for delivery. The price is $350. Please note, these can be used by plugging the battery pack in at the beginning of play, when both the machine and battery pack are fully charged. It does not work effectively if the battery pack is plugged in after the machine runs out of charge. An air pedal remote control is available for all Tennis Tutor ProLite models that turns the ball feed on/off at up to 24 metres away. The price for this remote including installation is $165. Tennis Tutor ProLite is backed by a one-year warranty covering both parts and labor. Please note that we do not stock this product instore as we usually send it directly to our customers from our supplier. We can arrange for instore collection if you call ahead of time.